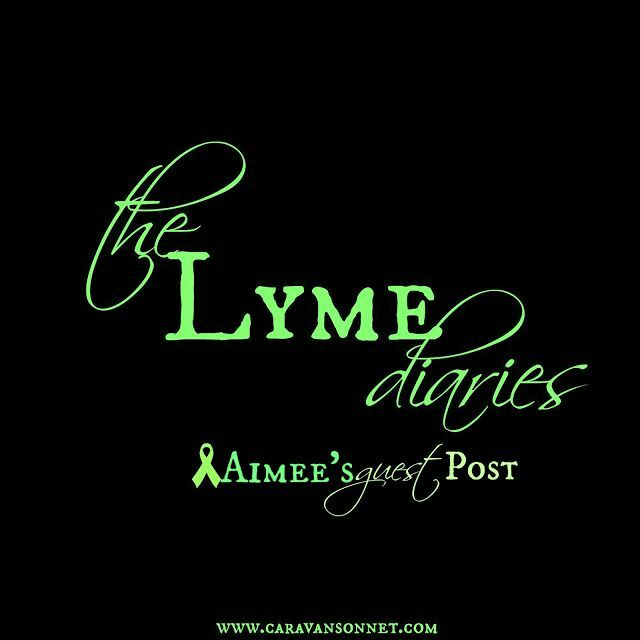 I am so excited to have Aimee share her heart today about her experience with Lyme Disease. Aimee Goodwin is the author of "Victory, a Lyme Story", which is available through Amazonbooks.com or through her publisher authorhouse.com. She is such an encouragement to me personally and I am so thankful for her willingness to share with us today! Thank you Rebecca for inviting me here today. My name is Aimee Goodwin. I like many of you am a Lyme warrior and survivor. It's a badge I wear proudly! I had chronic Lyme undiagnosed for five years. For five years, I searched for a Doctor Who could help me and found no one. Eventually I ended up going out of state to California to see a ILADS trained doctor in Redwood City. I fully credit him for saving my life and for the fact that I am here today. You can read my story in its entirety in the book I authored called "victory, a Lyme story." When Rebecca asked me to be a guest on her blog, she asked me to share a little bit of my story, and to share something inspiring. Rebecca, I don't know how inspiring I will be, but I shall try! As I contemplated this opportunity, many things came to mind after all the Lyme world is a vast place. This may seem like I'm wondering here but bare with me. One of the first things I did once I was well enough, was become as active as I could in helping others with the disease that had so ravished my own life. I spent a lot of time talking with people. On line, on the phone, in person. It was crazy how quickly those numbers grew. Eventually I ended up starting a support group in our area it was almost instantly a success. I learned that there is strength in numbers, that walking into a room full of people who understand you completely, is powerful. The support and wisdom shared there is absolutely priceless, I tell all new comers that they have just taken a powerful turn in the right direction in their journey. Lyme takes our power, it isolates us, it makes us feel like no one understands us. Getting that power back is a big part of the battle. I often say I get more from the group then I could possible give. I have met some of the most courageous people I know and I have made many true friends. They inspire me, and I am honored to know them. There are some personal frustrations though, I give them my support in anyway I can but often, I find myself feeling in adequate to give them the things they really need like money, insurance company's that pay the bill, or doctors that believe in the disease they are fighting. Often the only thing I have to offer is a heart felt "hang on" "don't give up". I'm known for it now, they all know when the "hang on" is coming, and I know it to, when there's nothing else I can do, it comes out. "Hang on." There are good things happening. There are good things coming. The Lyme world has changed allot even in the last 10 years. When I was looking for a Lyme doctor here in Minnesota eight years ago, there wasn't one. Lyme wasn't even on a doctors radar then but now, that's improved. More and more doctors are getting it, the debate now is how to treat it. But at least now it's a debate. For every doctor who tells you there is no such thing as chronic Lyme and that your crazy, there is another who is learning how to fight this disease. So hang on! The science is being proven, new studies are being done and entire clinics are being opened for research. Better testing is coming, better treatments are coming, so hang on! There are people out there who are dedicated to pushing legislation to help protect the doctors that we so desperately need they are passionate, and they are doing it. There are those fighting for Insurance coverage, so don't quit now, your going to want to be here to see the changes that are coming, your going to want to be here to see "someday" your gonna want to be here to see how much better it's going to be, your victories are coming, your not alone, so don't quit, keep fighting, and hang on! You see I know what it's like, I've been there. I have seen countless doctors who couldn't help me. I've been scared I would die before I knew what was wrong with me. I've had herxing episodes that made me want to crawl out of my skin rather then suffer it for another second. I've seen the looks of disappointment on my loved ones faces over things I could no longer do. I've been there. But, I have also been on the other side! I have experienced little victories at first like being able to sing again and then big ones like a month with no pain! And now, there is nothing I can't do. Lyme doesn't control me any more so I say, hang on. My book is available on Amazonbooks.com or through my publisher authorhouse.com both in an e-book and a paperback copy. I can be contacted through my Facebook page for victory a Lyme story feel free to like it and share it while your there or through email goodwinfamily@midwestinfo.net. Thank you so much Aimee for sharing your heart today! What a beautiful piece of encouragement this is for all of us Lymies and anyone walking this journey with them in the fight for their health!